V-Packings are multiple lip (chevron) packing sets designed to seal static, reciprocating and centrifugal applications. 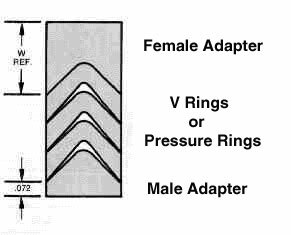 The male and female adaptors are used to complete a set of vee‚Äôs and to assist in sealing when compressed. To obtain a complete set, Male, Female and the number of pressure rings you require to make up a complete set.